Our Tasting Room is open daily, and we welcome guests to discover our wines and experience our warm hospitality. We are a multi-generational family winery with a strong agricultural heritage and a passion for growing and producing wines that connect to a place. This is the 14th vintage of Walla Walla Valley Sauvignon Blanc produced from our Estate grown fruit. The wine shows great proportion and is quite stylish. NEW RELEASE! Enjoy this lavishly textured, versatile, noble grape varietal! This wine offers classic Left Bank character and elegance that truly entices. Produced from some of the finest and most highly regarded vineyards in Washington State and the Walla Walla Valley. There is a distinct “expression” or “sense of place” in this wine. “Old Vines” Cabernet Sauvignon is incredibly complex showing the sophistication, balance and structure that come from such extraordinary “old vine” vineyards. This Non-Vintage Red Wine is a great everyday drinking red wine! 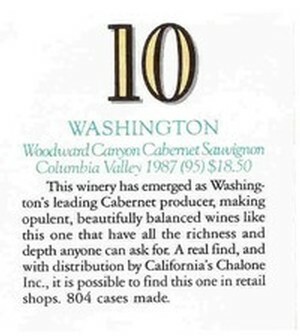 At number ten, Woodward Canyon’s 1987 Columbia Valley Cabernet Sauvignon is the first Washington wine named to the Wine Spectator’s Top 10 list.